Since the time Late Actress Sridevi passed away, everyone has been talking about her daughter, Jhanvi Kapoor’s debut movie, Dhadak. The movie has been Directed by Shashank Khaitan and produced by Karan Johar. The film is a remake of the Marathi blockbuster film Sairaat(2016). Dhadak’s trailer released today and it’s every bit impressive. It revolves around the lead characters Parthavi (Janhvi) and Meet (Ishaan), who are deeply in love with one another. While Janhvi can be seen acing the Rajasthani accent in the trailer, Ishaan just seems fit for the role. 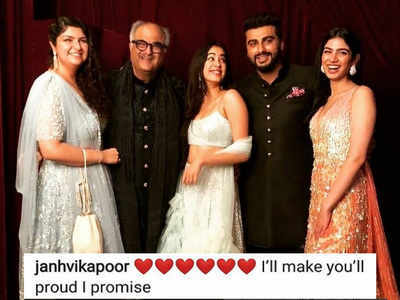 On Sunday evening, before the launch of the trailer, Arjun Kapoor took it to his social media account to write a few motivating words for his darling sister Janhvi. Dhadak is a debut movie of Janhvi Kapoor (Daughter of Sridevi) and Ishan Khattar (Step brother of Shahid Kapoor). Tell us how did you like the trailer in the comment section and stay tuned for more such updates! Next story SPOTTED! The Nawab & His Begum Kareena Enjoying A Lunch Date In London- Pics INSIDE! Previous story ‘Dhadak’ Trailer Out : Janhvi-Ishaan’s Phenomenal Acting Will Surely Make Your Heart Skip A Dhadak!